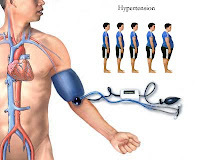 Hypertension Description is a persistent or intermittent elevation of systolic arterial blood pressure above 140 mm Hg or diastolic pressure above 90 mm Hg. Hypertension is a chronic disease, primary goals in Hypertension Nursing Care Plan is to reduce the blood pressure to less than 140/90. Primary (essential) accounts for over 90% of cases and is often referred to as idiopathic, since the underlying cause is not known. Cause of primary hypertension is not known. However, associated with risk factors such as genetic predisposition, stress, obesity, and a high-sodium diet. Malignant hypertension is also not known, but it may be associated with dilation of cerebral arteries and generalized arteriolar fibrinoid necrosis, which increases intracerebral blood flow. Ethnic/Racial African Americans and elderly people are most prone to hypertension and its complications. Measure blood pressure in both arms three times 3 to 5 minutes apart. patient is at rest in the sitting, standing, and lying positions. Hypertension should not be diagnosed on the basis of one reading unless it is greater than 210/120 mm Hg. Health education; Teaching: Diet, Disease process, Health behaviors.